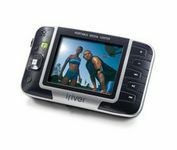 The iriver PMC-120 plays your movies, TV shows, music, photos and more. It features the ultra-intuitive MicrosoftÂ® Media Center interface and connects seamlessly to Windows Media Player. Plus, it comes complete with a widescreen vivid color display, integrated speaker, 20GB of internal storage and a removable rechargeable battery.